To be honest, I haven't even thought about taking any pictures of the farm this week. All I have on the brain are veggies, veggies, and more veggies. As I was trying to fall asleep last night, I kept seeing spinach leaves. In my dream, I was picking big beautiful spinach leaves. Don't know why this was on my mind as the spinach is way past its prime this time of year. I'm sure after a day of harvesting something else my tired brain will shift to a new topic, maybe the kale, peas or carrots. Shain apologizes for not contributing to the website this week. He is almost through reading a book which I can't wait to get my hands on. No it's not Harry Potter, it is called Animal, Vegetable, Miracle, by Barbara Kingsolver. It is about a family who eats only locally grown foods for an entire year. He highly recommends it! 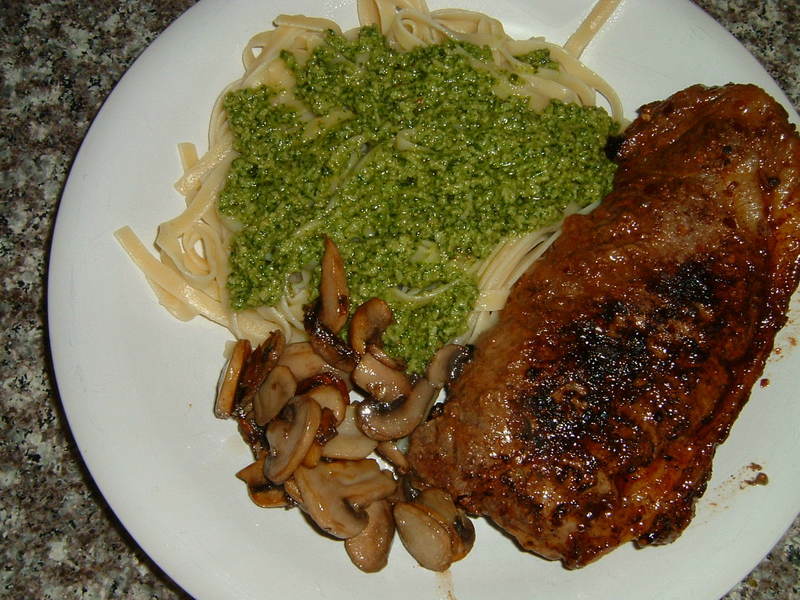 Here is a new recipe contributed by a fellow CSA member. Blend in a food processor on high speed until creamy. 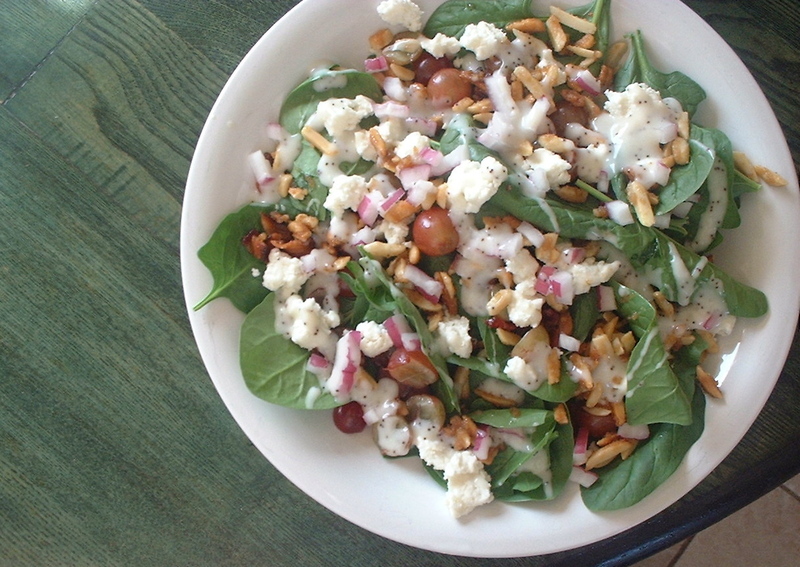 Eat with fresh veggies, crackers, pita or on top of a green salad. Garnish with Kalamata olives. Flavor is best if it sits in the fridge overnight or longer. 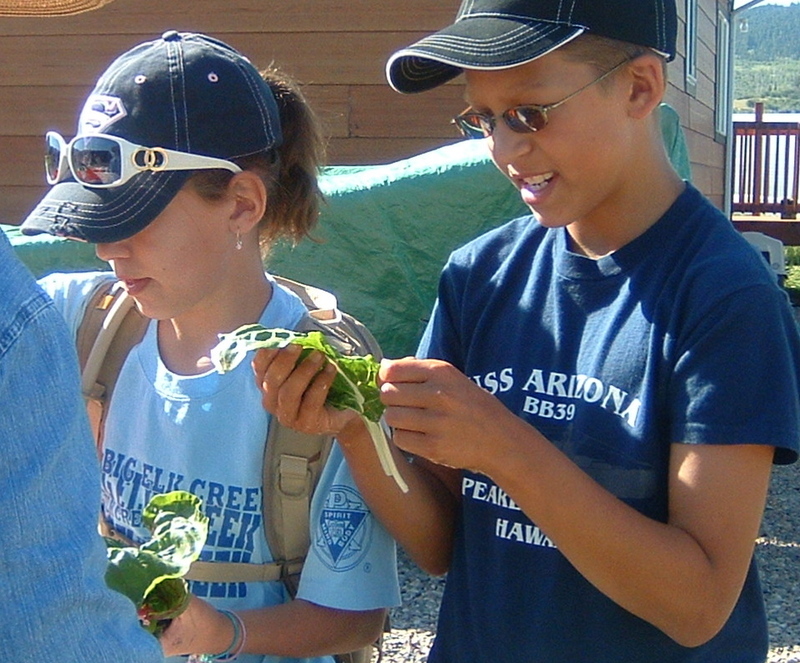 Again this week our farm was host to a group of students from the Lower Valley. Bob, their teacher and an EverGreen Farm CSA Member, brought a group of about twelve 5th and 6th graders to experience the farm. 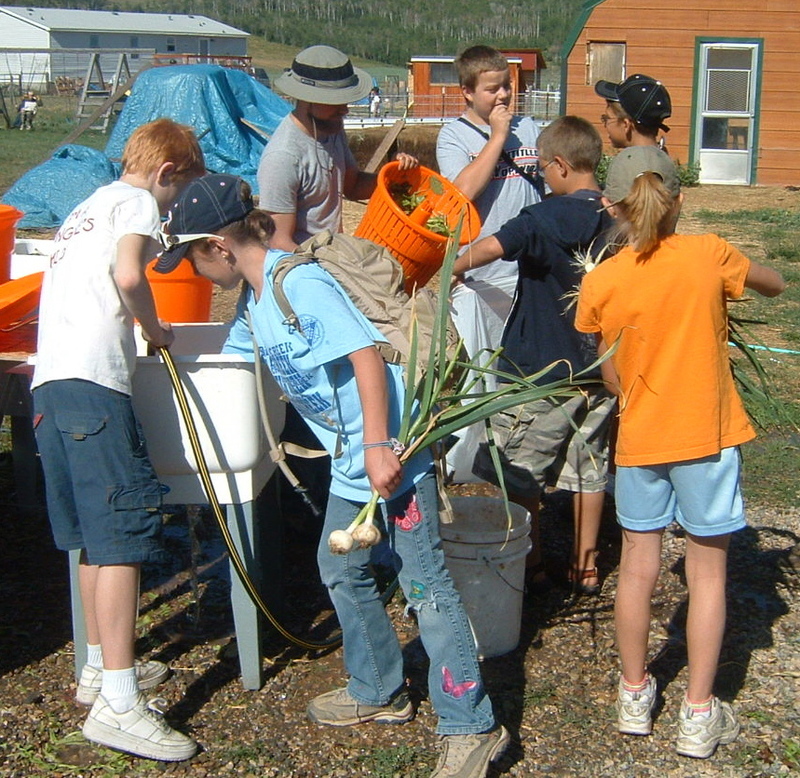 This time they came to harvest some food to take with them on an over night camp to Cottonwood Lake. With some guidance, they harvested salad, onions and garlic. If you ever find yourself with "extra" herbs and don't want them to go to waste, I have a helpful hint for freezing them. This tip works especially well with parsley and cilantro. Just place the herb in a blender (stems can be removed first if you desire) and puree with as little water as necessary to get the leaves to chop. Then pour the mixture into ice cube trays. Once solid, the herb cubes can be frozen in a freezer bag and used as needed. The herb's true flavor is maintained incredibly well, it smells and tastes so fresh. Just pop a cube into a soup, mashed potatoes, spaghetti sauce, or whatever. Or you can put a cube in a strainer and allow the water to melt off, then add the herb to your cooking. Cook angel hair pasta per package instructions, drain and refrigerate until cool. Meanwhile, fry one package of bacon. Remove from pan and crumble bacon strips when sufficiently cool. Mince 2 to 3 cloves of garlic and set aside. In a large frying pan, heat 2 tablespoons of the bacon grease and 2 tablespoons olive oil. Brown the minced garlic in grease/oil. Remove stems from parsley and coarsley chop, you will need approximately 1 cup. When garlic is browned, add cooked pasta to the frying pan and fry until lightly cooked and warmed through. In a bowl, mix fried pasta and garlic, 1 cup of freshly grated Parmesan cheese, crumbled bacon, and chopped parsley. Toss until well mixed. Serve immediately. What is it? A strange new crop we are growing? A cactus? This ??? looked so cool today as I was walking around the garden that I had to take a picture. Now I've got this idea that I want to include YOU in a little guessing game. There will be an extra surprise in next week's share for the CSA member who can first email me the correct identification of this photo. The winner will be posted on the blog later. Edit: Congratulations to Matt D. who correctly identified this photo as Swiss chard stems left behind after the leaves have been picked. I love all the colorful stems from this Brite Lights variety. They are truly beautiful to me. Thanks Matt (and others) for playing my little game. This is a picture of me (Tara, in the middle), my daughter Megan, and my father-in-law Max, at the Farmers Market in Jackson last Saturday. It is where we have been and will be spending our Saturday mornings through September 15th. Max drives up to the farm each week from Ogden to help us harvest and go to market. Megan is in "training". It is exhausting work getting the produce ready, and working our stand selling it all, but we do have a lot of fun. We especially like meeting people face-to-face who eat our food and we love hearing their compliments when they return the following week for more. If you are near The Jackson Town Square on a Saturday morning, between 8 and 11 am, stop by to say Hello. 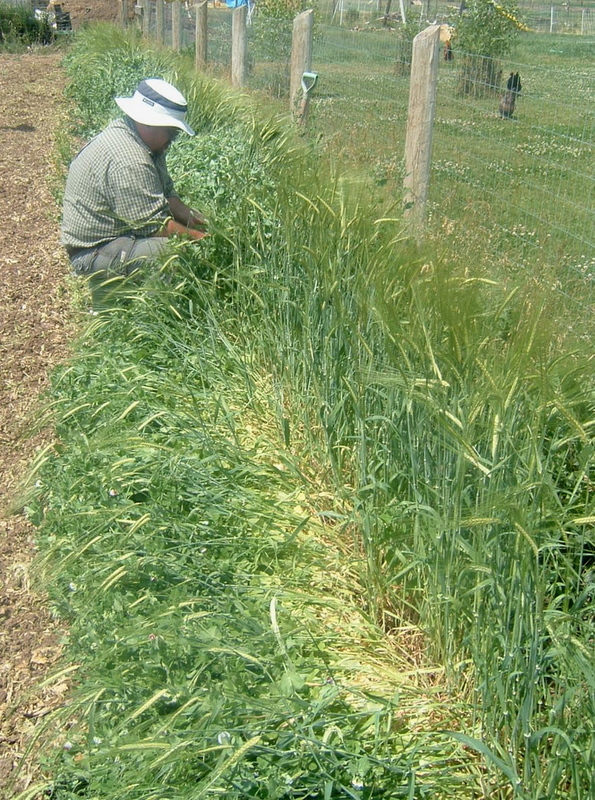 In CSA Newsletter #5 I showed you a picture of the pea plants growing up a nice trellis of barley. I think I jinxed us by telling you our secret of planting peas because... well, I the picture below says a lot. This is what that same row of peas looks like now, after a brief but powerful wind storm swept through our place last Saturday evening. (Those are mostly peas laying on the ground to the left, no longer growing up that nice trellis of barley to the right.) But like I said, our odds are only about 50% of this technique being successful. No real harm done, we just have to pick up the vines off the ground now so we can pick your peas. 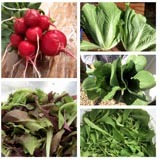 Produce update: the peas are starting to come on, carrots and beets are coming soon. Next week there will be parsley. There are a few tiny tomatoes on the vines. Bad news: we have a major aphid infestation in the kale. The nasty little buggers have wiped out about half of our kale planting. There are millions of aphids on the undersides of the kale leaves and they don't wash off. We are hoping they don't spread too far in the garden. We've experienced quite a few bug problems in the crops growing in field #2 (which were mostly early season greens, and my favorite Japanese turnips) so the plan is to rotate these crops over to a new field and plant field #2 with garlic. Most bugs don't like garlic. We are always trying to find ways to out-smart the bugs. 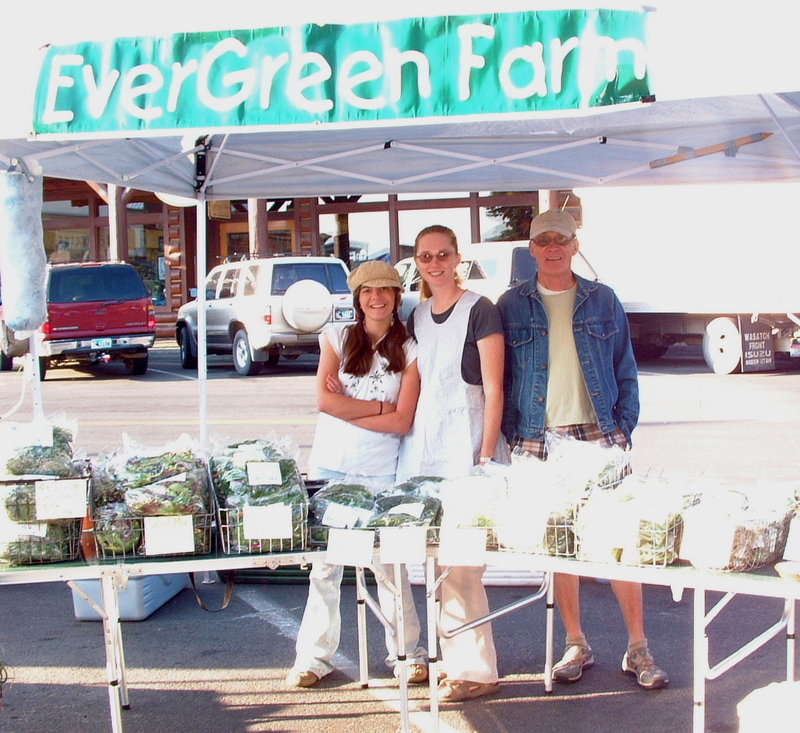 We had our first Farmers Market of the 2007 season last Saturday in Jackson, only 10 more to go. I feel like it was quite a success. It was nice meeting a few Jackson CSA members who stopped by to introduce themselves. I am sorry I haven't posted any new recipes lately. If you have something you'd like to share with us, send it to me via email. Meanwhile here are the directions to make this yummy omelet Shain made me for lunch today. Thinly slice garlic scapes and saute in butter with sliced mushrooms until cooked. Meanwhile, tear swiss chard and spinach into 1 inch pieces, discarding stems. 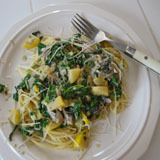 Add greens to cooked mushrooms and scapes and wilt in more butter or chicken broth. 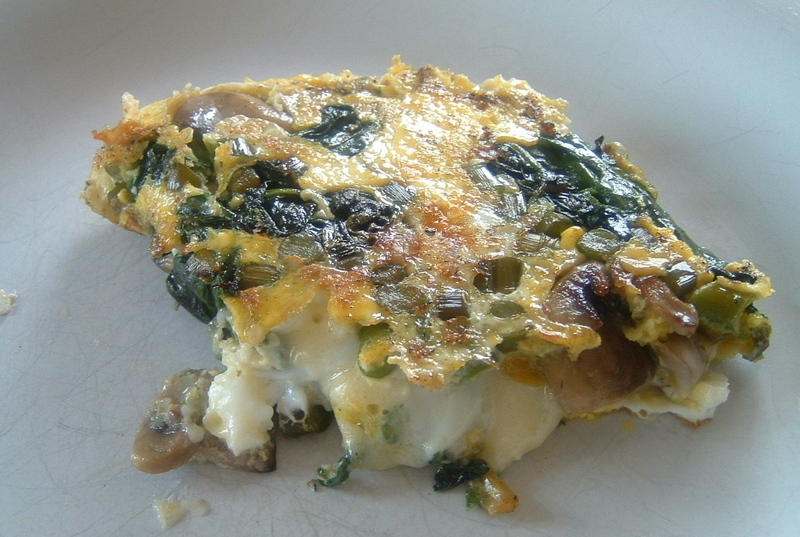 Grease an omelet skillet with butter, then add wilted greens/scapes/mushroom mixture and spread evenly in skillet. Beat 4 to 5 eggs and pour over saute mixture. Top with hot pepper jack cheese, salt and pepper to taste. Cook slowly over medium low heat until eggs are cooked on top (dry but not crusty). Fold and serve. Can't get enough of these yummy salads. This one has spinach, grapes. red onion, bits of bacon, carmelized almonds, queso blanco goat cheese and is topped with Brianna's poppy seed salad dressing. I sincerely apologize if you are ever missing one of the items which is supposed to be in your weekly share. We are do our best to divide the shares up as accurately as possible each week, but there are bound to be times when we aren't perfect. If you will let me know, I will do my best to make it up to you the following week. Otherwise, we appreciate your understanding. 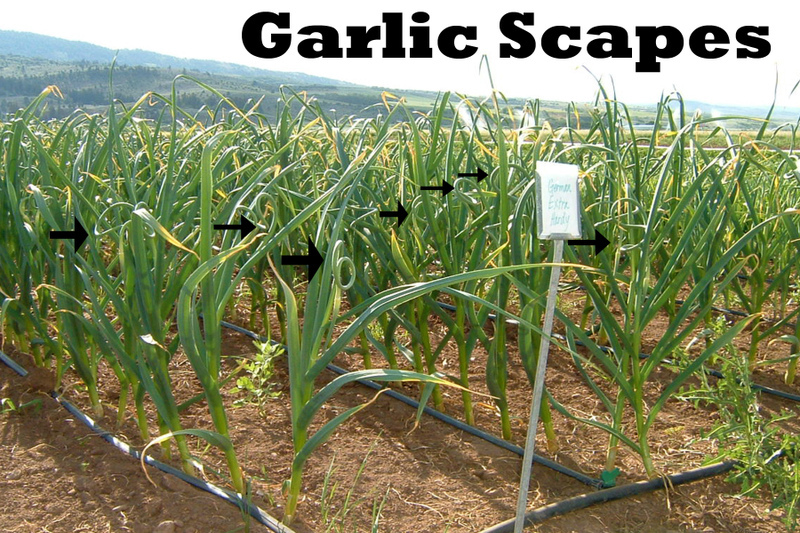 So many people have questions about garlic scapes and have a hard time visualizing where they grow on the garlic plant. Here's another photo. The arrows are pointing to the scapes, which we simply snap off with our fingers. Can you see them? They look a bit like little curly piggy tails. 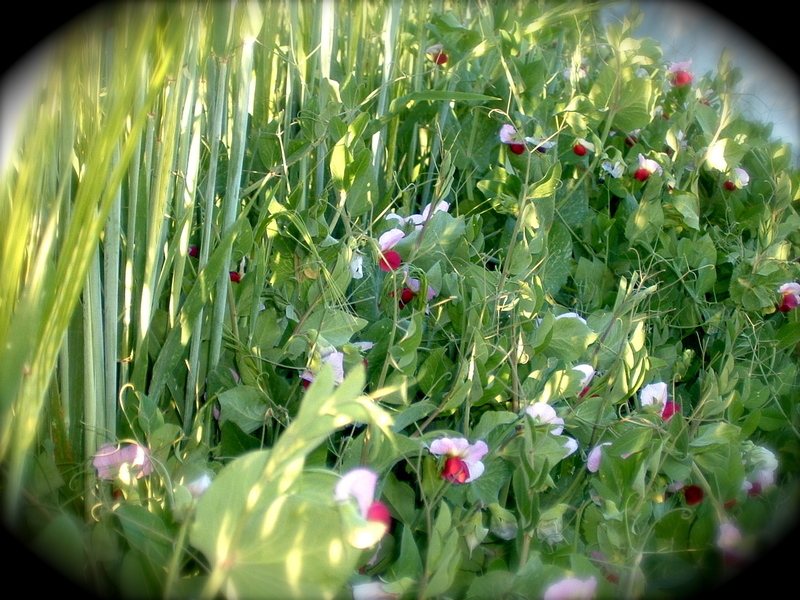 Next up is a picture of the beautiful snow pea blossoms, they are a pretty shade of purple. Well it finally happened. On Saturday June 30th, Trinidy had her kids. I missed the delivery by about 30 minutes and found Trinidy doing her best to clean the girls up and get them moving. Sadly, one did not make it. She was lifeless when I first came upon them in the barn and there was nothing I could do. One of the realities of raising livestock, but still not enjoyable. 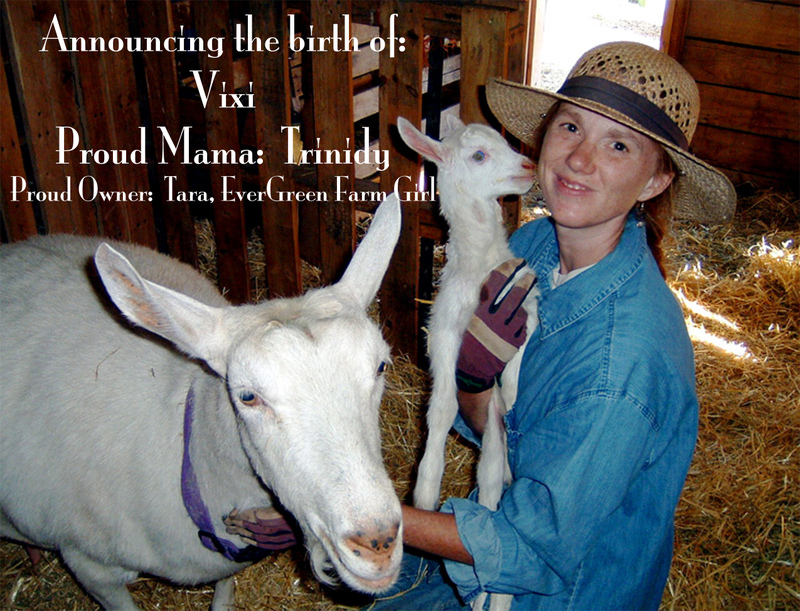 "Vixi" is the surviving doeling. My son, Eli, picked out her name. It is Latin and means "to be alive, to live". She seems to be doing well. Although I'm not confident in her eating skills because I haven't personally seen her nursing. I keep going out and putting her up to her mama to eat but she isn't interested, I'm hoping that means she just ate and is full. She is up and walking around, so I'm not too worried. Goat kids are one of the funnest things to have on a farm. If you have the opportunity, you are welcome to bring YOUR kids out and hold Vixi and see the other animals we have here: ducklings, ducks, chickens, baby pigs, Zip the dog, any one of our cats (we have an excellent rodent control program), and all the other goats.